If you are looking for a small landscaping tree with a difference Cussonia paniculata is one to consider. 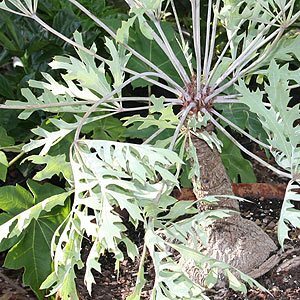 It grows well in dry conditions, develops and interesting fissured trunk over time and have foliage that is bound to attract attention. Cussonia paniculata or South African Cabbage Tree is probably the pick of the cussonias, growing to about 4m. Cussonia spicata is a taller growing species to around 5m in height. Cussonia make great specimen plants, with interesting ‘architectural’ features. These trees will flower, the flowers appear in summer and are green. The gnarled trunk of older specimens is a feature, and they do look great grown in a sunny courtyard. Although classed as evergreens they will drop foliage in frosts or very cold weather. Two species of Cussonia paniculata are available one is smaller growing than the other. This is a slow growing tree, well suited to large pots and containers, drought tolerant once established. Over time it will reach around 4m to 5m in height, a tall stem with a rounded clump of foliage at the top. Cussonia do not like frosts, other than that they are reasonably easy to grow. Propagation os from seed, however they do need to be fresh to show good germination rates.